Coat: RED Valentino (on sale). Scarf: White + Warren. Flats: Chanel (love these and these). 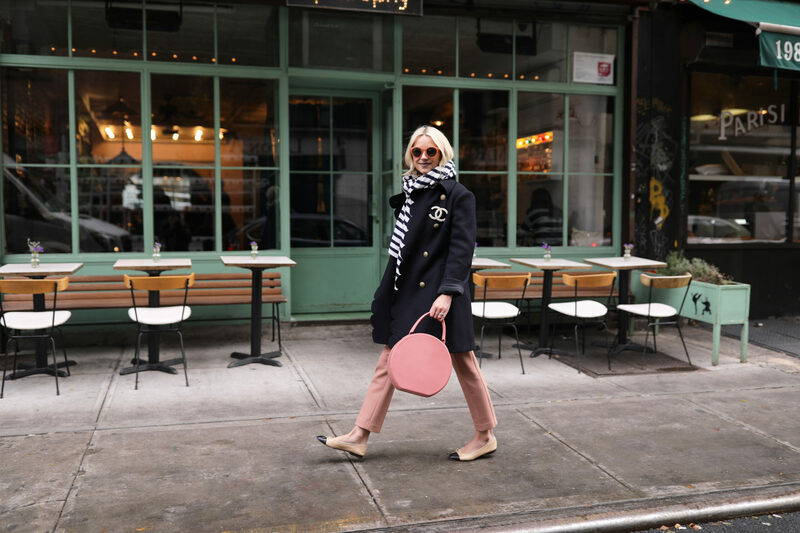 Bag: Mansur Gavriel. Pants (on sale). Top: Jcrew. Sunglasses: Gant (similar here). Pin: Chanel (similar). I love how chic this look is! Very Jackie O. Love the color combo as well. Love the pink elements of this outfit! Love that bag. Gorgeous color. Always looking gorgeous and so stylish!! Gorgeous look! I really love the blush and navy color combo! This color scheme is so beautiful! 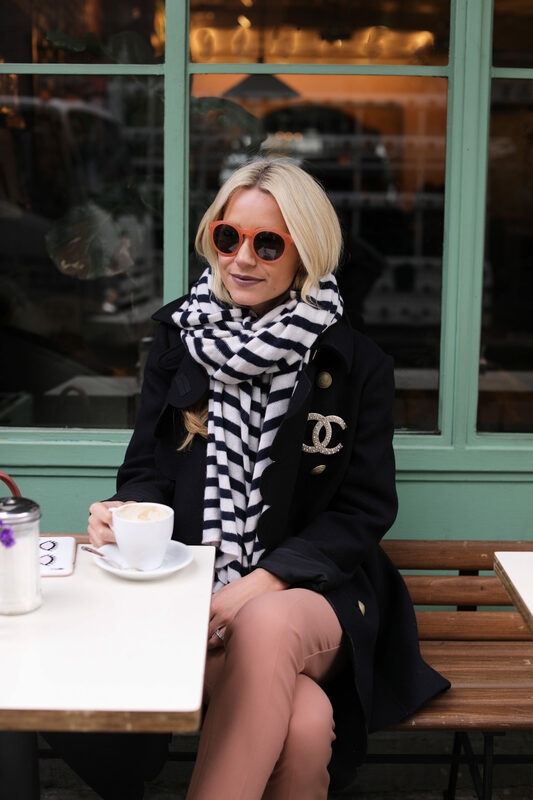 LOVE that stripe scarf! Adds such a punch to the look! 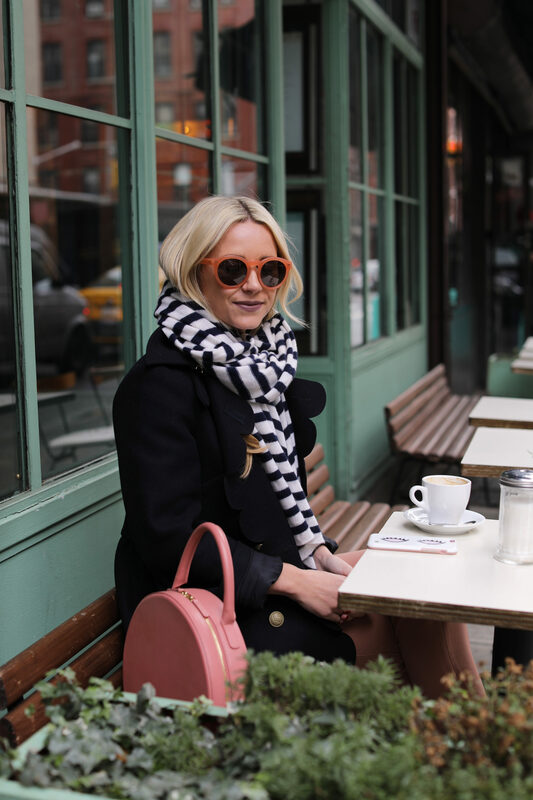 I’m obsessed with that striped scarf! So cute! That blush round bag is perfection! Love the Chanel pin too. Amazing style! I love your pic. J’adore!!!! The pop of blush looks great with the navy! Adorable, love the flats. You can be stylish and comfortable at the same time hah!